Everything changed recently for one hopeful job-seeker who'd been having a hard time finding a workplace that would be accepting of his faithful service dog, Blue. This store decided to hire them both. The filling of a local job vacancy is rarely cause for a company-wide announcement, but the story of these new employees is too charming to pass up. "A recent hire is a gentleman that was having difficulty finding employment because of a brain injury and a support dog. 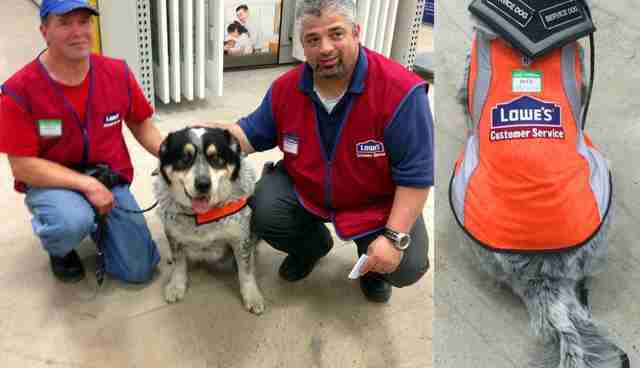 So we did what Lowe's does best: we hired him and outfitted Blue, our customer service canine, with his very own vest!" Blue got his own name tag, too. Blue and his owner/colleague have been making a splash at the store in Regina, Saskatchewan, where they work - but the decision to give them both a job is earning praise across the country, and for good reason. "Way to spread compassion and employment," wrote one commenter. "Hope other companies follow along with you to help those with special circumstances."